Japanese knotweed is an infamous plant that can wreak havoc for many homeowners. The plant lies dormant in winter but once summer arrives it can grow a foot a week and suppress other plant life in the garden. On a more serious note, it can jeopardise your chances of selling or buying a home, with some lenders refusing to grant mortgages due to the weed’s destructive nature. How do I spot it? Japanese knotweed can be recognised for its lime-green bamboo-like stem, speckled purple and red. The leaves are heart-shaped – with sprouts having a reddish tinge and turning a lime green. In the summer, they produce clusters of creamy-white flowers. The plant’s extensive roots can penetrate deep into the ground – damaging house foundations, drainage systems and walls. Our advice would be to deal with the plant as quickly and as privately as possible. The first thing to do after identifying the knotweed is to take photos of it and email them to a weed control company. Then, a specialist might charge for a site visit to survey the situation. You are then faced with the option to remove the knotweed yourself or pay a professional to do it. It is not illegal to grow knotweed, but you must keep it under tight control and prevent it from spreading to neighbouring gardens. If it is deemed to cause a ‘detrimental effect of a persistent or continuing nature on the quality of life of those in the locality’ then your local council can order you to dig it up and destroy it. Under the Wildlife and Countryside Act 1981, it is also an offence to allow knotweed to grow in the wild. Find out more from Royal Horticultural Society about how to deal with Japanese knotweed. 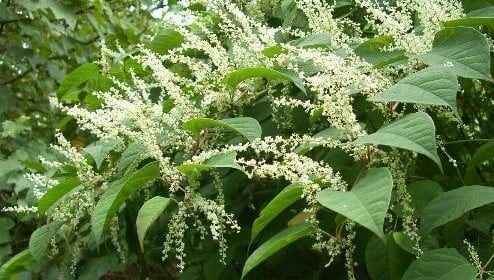 If a loan or mortgage provider come across the words “Japanese knotweed” on a surveyor’s report, it could endanger your hopes of buying or selling a home. At the very least, the provider will demand a professional eradication plan that could cost thousands of pounds, with experts forced to provide a lengthy guarantee against the knotweed’s return before a mortgage offer is made. My house is in poor condition and won’t sell, what can I do?